"Give fat the cold shoulder." That is the catchy advice in a video of a scientist who believes he is on to something to support weight loss, and that is The Cold Shoulder calorie-burning vest. Dr. Wayne B. Hayes said it can help a person burn an extra 500 calories per day. Swimmers burn a lot of calories in their workouts but swimming in cold water also contributes to the amount of daily calories burned. Olympic swimmers spend their time in water that is about 20 degrees Fahrenheit below their body temperature. This temperature difference extracts calories from their bodies. He said the difference makes them burn way more calories than exercise alone. The vest's basic concept is clothing with ice-pack inserts which serve to help burn calories. Actually, the effects of mild cold exposure on humans have been studied by scientists, with documents that discuss how mild cold exposure induces calorie burn. In April, a research paper from The Netherlands, by Wouter van Marken Lichtenbelt, Boris Kingma, Anouk van der Lans and Lisje Schellen was published in Trends in Endocrinology and Metabolism. The title was "Cold exposure – an approach to increasing energy expenditure in humans." The authors suggested that regular exposure to mild cold may provide a sustainable alternative strategy for increasing energy expenditure. Obesity is linked not only to excessive food intake (energy intake) but also to physical inactivity (reduced energy expenditure). "In the past two decades major scientific and financial interests have focused on counteracting excessive energy intake to tackle 'diabesity'. This approach now appears to be rather disappointing in terms of Public Health and,until now, effective treatment strategies against obesity and T2D [type 2 diabetes] are still lacking." The paper's hypothesis was that the thermal environment affects human health – and more specifically frequent exposure to mild cold can affect energy expenditure significantly over sustained time periods. Dr. Hayes said his vest solution showed it could burn about a pound of fat a week—about 500 calories a day. You wear the vest for two hours a day. 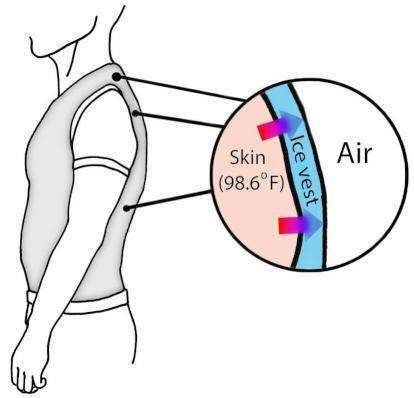 The Cold Shoulder, with ice draped over the shoulder and across the back, worn against the body, lowers your skin temperature and forces the body to burn calories to generate heat to keep you at your core temperature. Ice over the shoulders and across the back are comfortable places to put the ice, he said. Hayes is a professor at the University of California, Irvine, and visiting scientist at NASA's Jet Propulsion Laboratory in Pasadena, California. He has turned to Kickstarter to help place the vest into large-scale production. 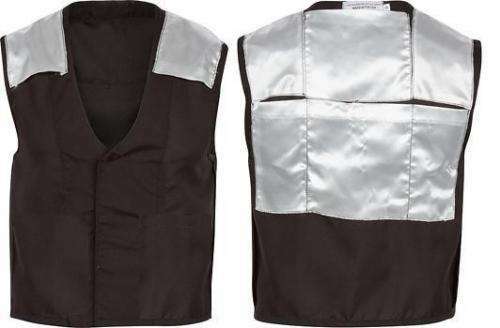 "Although we have the designs and prototypes finished and our manufacturer stands ready to produce the vests, the cost of production is high unless we fulfill minimum order quantities." Pledge prices vary with types of offers and the information is up on Kickstarter. Since the start of the campaign a number of reward levels are already gone. Out of a $13,500 goal, he raised $257,207 at the time of this writing. Hayes makes a point of distancing himself from vendors of miracle solutions where one is told to continue eating anything, maintain a sedentary lifestyle and place all expectations on a pill, tablet, powder or magic bracelet. "Let's be blunt," he said, "there is no magic pill for weight loss, and The Cold Shoulder is no exception to that rule. The cold, hard truth is that the foundation of weight control is your diet. In order to maintain a healthy weight, do what grandma told you: eat your veggies, cut the fat off your steak, and avoid junk food, especially sweets." If one continues to eat junk, he said, no amount of cold exposure will help you lose weight. He cautioned, "don't expect that you can continue to eat junk food, wear the vest, and lose weight. You can't." The ideal candidate for vest-wearing success is someone already eating well, getting moderate exercise and who wants to accelerate calorie-burning efforts by burning excess calories while at rest. My wife has MS, and MS patients are also very sensitive to overheating. This could ... well I don't want to use the phrase "kill two birds with one stone" ... but solve multiple problems at once. Then again, if it's intended to treat a disease, it has to go through FDA approval processes as a medical device, no? I started taking baths that were, if not freezing, just slightly under a comfortable temperature level. It takes a little discipline to get in, but after about 30 seconds your body picks up the slack and it just feels like you are sitting in warmish water. After soaking for about 40 minutes or so, when I get out I am cold all over and strangely energetic. It's interesting sometimes anyway, and if you drink you "feel" too warm to begin with, and it's actually somewhat pleasant to be in cooler water. It seems weird, but if you ever went swimming in nature, you know that water is usually about that temp or cooler without natural heating. I'm not an academic but have been observing obesity for 30 years. I have been tempted to believe that reducing the skin temperature would result in burning calories. I now suspect it would have the reverse effect and make the body hold on to its fat for insulation. I'm unable to find a study to suggest that populations in colder climates have less incidence of obesity but the BBC News website covers a study done in 2000 that found children who emigrated from a warm to a cold climate were prone to obesity.